The quest is one of my personal favorites. Originally designed by a group from the Netherlands the Quest is available at http://www.bluevelo.com/quest_velomobile.html if you are in North America or http://www.velomobiel.nl/ if you are in Europe. 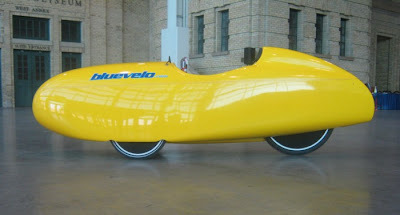 The velomobile.nl site has it listed as made from fiberglass as a base model or carbon fiber as an option. The price listed on the North American site is currently listed at just under 8000 dollar Canadian. It is listed as costing just under 6000 euros including the 1.9%VAT. From what I am told the only drawback to the quest is its width. As you can see from the picture the front wheels are fully enclosed adding to its width. The trade-off is a beautiful aerodynamic design that cuts through the wind wonderfully. It also has a kayak style hood available to keep you dry on rainy days. Update : I recently received some information on the Quest. It appears that the Quest is only 30 inches wide. That should make it narrower than the Mango. I have also received information that Bluevelo Development has been making the Quest since 2009. The Quest is also one of my favorites.It should be said the Quest is an extremely popular velomobile and is a daily runner of many. Thanks for the comment. I would love to get a hold of some sales figures. It does seem as if a bunch of velomobiles seen are Quests. My sister recently spotted one in Ashville, Ohio. The Quest is actually narrower than a Mango. The front wheels are 24" a part on the Quest and over all it's 30" at it's widest point. As of today I will pass the 14,000 mile mark with my Bluevelo Quest. 14,000 miles in 111 weeks. It's running as smooth as silk and as fast as, faster than any road bike. I would love to see the same thing for bluevelo as well. Thanks again for putting this site together.